U.S. President Obama has declared a major disaster in the wake of the devastating tsunami which washed over American Samoa and Samoa. 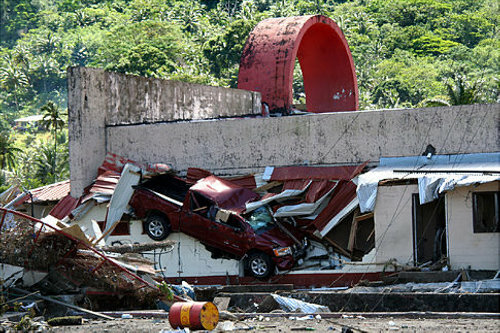 Dozens have already been declared dead, and towns like Pago Pago in American Samoa (seen above) have been rampaged. The waves were caused by massive undersea earthquakes, registering around 8.0 on the Richter scale, which generated enough momentum in the ocean for the waves to reach up to 20 feet high in some places. As images and stories of the wreckage surface, Samoan expats living abroad are mourning the loss of lives and hometowns. “I’m at work and I’m supposed to concentrate, but it’s hard,” said Elizabeth Gerstle, 35, a Staten Island banker who left Independent Samoa as a child. “In such a small island, it’s almost unavoidable to escape the effect of something like this,” said Regina Alaimalo, 41, a legal project coordinator who lives in Astoria. “This morning when I woke up my heart just sunk with sadness,” Alaimalo said. Our hearts here at expatify go out to all expats from Samoa and American Samoa, and everywhere else that got struck with one of the tsunamis over the last 48 hours. And of course, for those expats living within the islands, and to everyone affected, our thoughts are with you. If you’d like to see what you can do to help, or if you can donate funds to relief efforts, the folks at google have put together a comprehensive list of sites and organizations which can handle donations and offer information. Please, check it out and see if there’s anything you can do.